We have quite a line up to end our first season of Élevé. This series has been an awesome platform for us to invite colleagues from several disciplines to collaborate with us for an evening of artistry, beautiful aesthetics, and one heck of a good time. For the finale, we'll be performing the MYTHES by K. Szymanowski. Arethusa, Narcissus, and the Nymphs and Pan are the mythical characters that inspired the 3 movements of the MYTHES. You'll for sure hear quite the soundscape that explores the stories, emotions, and trajectories of each mythical creature. We're not stopping there. We are also adding another artist for this exploration of the MYTHES. Harold Green, the amazing spoken word artist, will be joining us and performing original work within our performance of the MYTHES. We're so excited to not only work with Mr. Green, but his incredible storytelling will completely take this experience beyond the original source by adding elements of modern word, experience, and culture. Tickets are available for Élevé via Brown Paper Tickets. Tickets include admission with either 2 or 3 drinks tickets for the amazing cocktails provided by Rhine Hall Distillery. We're so looking forward to seeing you at the finale! Bow & Hammer's new EP is being released today! Available for purchase at www.bowandhammer.bandcamp.com, you can hear B&H's recording of the 3rd movement from Milhaud's 2nd sonata for violin and piano AND the 1st movement of the 3rd sonata by Brahms. This is an awesome intro to B&H's style, aesthetic, and sound. We hope you enjoy! EP: Brahms and Milhaud was recorded, mixed, and mastered by Bob Weston. Industry Night w/ Angel's Envy! Now this pairing we find especially on point because we'll be performing the 3rd Sonata by Johannes Brahms. This sonata is jam-packed with all of the ups and downs in any brilliant novel, and we are so excited to share this work with you, as it is super near and dear to our hearts. And of course, last IndustryNight winner, Poulenc: I. Allegro Fuoco will be performed! tickets to industry night are still available online or at the door for $10. NOTE: attendees must be 21+years to attend! We've had an incredibly thoughtful and reflective week. We have launched a new campaign to help fund and expand our infrastructure, and in the process, we took a moment to think about our mission, our process, and how to share with you why we believe our projects, collaborations, and trajectories are so important. We thought of how we could describe our process for creating performances and experiences, and ultimately, we found that rootbuilt says it all. what is rootbuilt, you ask? Rootbuilt describes the process of constructing a live artistic performance that is only possible when built upon the roots of respect, skill, and relevance. what's the big deal about artistic performance? Through the abstract nature of performance, art provides a larger and potentially removed perspective of everyday occurrences, creating space and a unique opportunity for us all to process everyday life differently. why do I need the artistic performance to be rootbuilt? We have found through our experience that this model consistently creates the highest quality with the greatest efficiency. What a combo! how does this rootbuilt thing happen? Imagine a triangle with these three points: Performer, the Art, Audience. Each of these points is critical to the rootbuilt experience, and each point is connected with the two-way channels that intertwine each component’s Relevance (opportunity), Skill (responsibility), and Respect (fulfillment). Each point is critical to the success of the other two. When one becomes disconnected, the whole process deteriorates. Together, and only together, we actively connect all three points. As the Performer presenting the Art, we pledge to you to keep those communication channels open tirelessly and earnestly. If you’ll participate and take up your role as the Audience, we can connect all three points and sustain this rootbuilt experience indefinitely. We will have no limits on where we travel, who collaborates with us, and how we can document the successes of this truly interactive performance model. Be part of this movement! Make a pledge! what's an example of rootbuilt? At our home-base of Chicago, we have a couple running performance series that already use this rootbuilt foundation to collaborate with something very relevant in Chicago: food. Through “Industry Night” and “Élevé”, we collaborate with chefs, farmers, distillers, and brewers for interdisciplinary performances that satiate all 5 senses in one night. At the Banff Centre, in Banff, Canada, we recently presented another rootbuilt collaboration with their restaurant, and you can read about that here. We have so many other plans up our sleeves, and can share them if you believe that rootbuilt is the way to go, and will join our efforts by making a monthly pledge for this movement! The more you pledge, the more channels of communication we are able to open to you. Check out our goals to see more specifically how your support directly affects our success. Thanks SO much for taking a stand in this rootbuilt movement. It means the world to us. You are the world to us. WFMT: This Classical Music Inspired Cocktail is a "Ravelation"
Read the article by WFMT's Sarah Zwinklis about our collaboration with Rhine Hall Distillery and Ovation Chicago for our new series Élevé! Cellist Hope Shepherd is a member of the KAIA String Quartet, a Chicago based ensemble that works to promote world music as well as traditional string quartet repertoire. Ms. Shepherd has worked with some of the country’s leading conductors, chamber musicians and soloists. As principal cellist of the Civic Orchestra Chicago, and as a fellow at the Tanglewood Music Center, she has had the opportunity to play under renowned conductors James Levine, Riccardo Muti, Kurt Masur, Jaap van Zweden, Michael Tilson Thomas, and Sir Andrew Davis. She has performed with cellist Yo-yo Ma as part of the Chicago Youth in Music Festival, Story Catcher’s Theater at the Illinois Youth Center and the annual Depauw University Discourse. As a student at Arizona State University Ms. Shepherd participated in a unique String Quartet Residency program that allowed her to receive instruction and perform alongside members of the Juilliard, St. Lawrence, and Brentano String Quartets. A dedicated teacher, Ms. Shepherd has maintained a private cello studio for the past ten years. In addition to teaching privately, she has been a cello and group class instructor through Arizona State University’s String Project, a coach for ensembles in the Chicago Youth Symphony Orchestra, and is currently a Suzuki Cello teacher at the Merit School of Music in Chicago. Ms. Shepherd has performed as a soloist with the Tucson Symphony Orchestra and has given recitals at Katzin Concert Hall in Tempe, AZ and Duncan Recital Hall in Houston, TX. 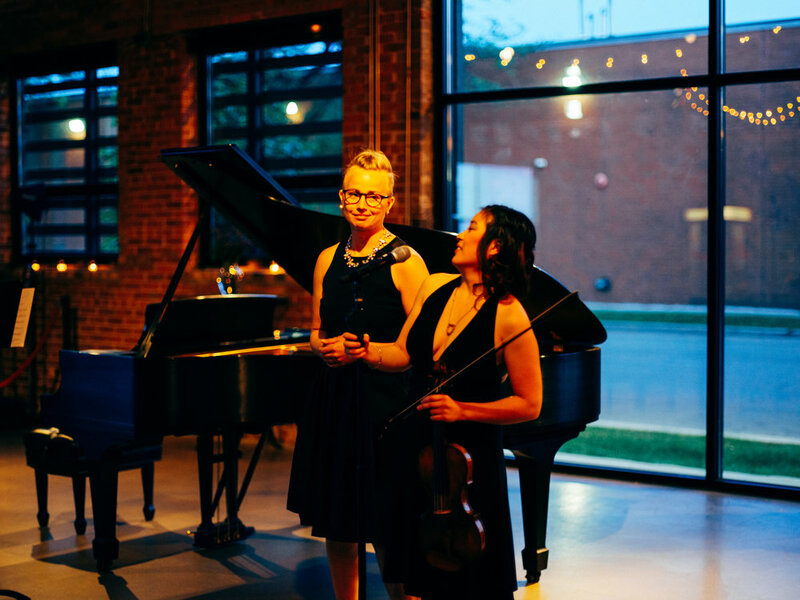 As a founding member of the Allium String Quartet, she has performed at the World Summit for Nobel Peace Laureates, in a performance at Mayne Stage Theater broadcast live on WFMT, in recitals for members of the League of the Chicago Symphony Orchestra, and at local coffee shops. Ms. Shepherd holds a master’s degree from Rice University where she studied with Brinton Averil Smith and bachelor’s degree from Arizona State University with Thomas Landschoot. Michael Schneider is a violist who plays an active role in the Chicago arts community. As a performing artist he collaborates with ensembles such as Fifth House Ensemble and Chicago Composers Orchestra, performs with regional orchestras throughout the Midwest, and has an active chamber and solo career. International performance reviews have regarded Michael’s playing as “elegant, soulful and poetic.” Michael is the Program Assistant for Sharing Notes, a local non-profit organization that brings over 70 performances to hospitals in the Chicago area. Michael teaches violin and viola at Carthage College, Chicago Center for Music Education, and the Chicago West Community Music Center. Michael has completed his Master of Music from the Chicago College of Performing Arts and his Bachelor of Music from the Cleveland Institute of Music, studying with Igor Fedotov and Mark Jackobs, respectively. join us on march 22nd! industry night welcomes: Honey Butter Fried Chicken! tuesday, march 14th and HBFC is comin' ova to 2620 W Washington! "We believe that you should feel good about your food—where it comes from, how it’s prepared, how it is served and by whom. So when you eat our chicken, our sides and desserts, we hope you’ll spend some time thinking about the ideas behind every bite." Hear it next industry night on May 9th! what a fabulous last week in beautiful Banff! ADRIAN FUNG is no stranger to Banff, and joined us from Toronto (locally pronounced TCHRON-oh) with multiple aces up his sleeve: award-winning cellist, founding member of the Afiara Quartet, arts executive, educator, producer, and did we mention he’s also VP of Innovation of the Toronto Symphony Orchestra? NBD. Meetings with him involved fast-paced mock interviews and business pitches, honing our dreaming skills (and by honing, I mean pushing them farther than we had ever allowed), and flipping our perspective of negotiation on its head to actually achieve those dreams. Exhilarating might start to describe this experience. ALAN PIERSON, a fellow Chicagoan (originally, anyway)! Though he’s mostly out in the world as the Artistic Director and conductor of the 20-member ensemble Alarm Will Sound, Principal Conductor for Ireland’s Crash Ensemble, Artistic Director of Brooklyn Philharmonic, he also makes regular visits to Chicago as a Conductor/Lecturer at Northwestern University. Using his “against-all-odds” success experience from Alarm Will Sound, he think-tanked with us about our mission and identity to give us that edge into progress and gave us endless resources to support those steps. Before we share with you the beautiful projects and concerts of the last week, we wanted to first write our sincere thanks for the past 3 weeks. We grew so much, gained exorbitant amounts of information, and gained such an inspiring and energetic network of colleagues and friends. We canNOT thank everyone involved enough for this amazing opportunity. It is incredibly fulfilling to affirm that through mutual respect, empathy and artistic freedom, we can create such tangible expressions of human connection and restoration in our communities. and a special thanks to the Banff Centre Team! It's concert time at Three Ravens Restaurant! We had the most distinct pleasure of spending the week with President and CEO of the Washington Performing Arts, Jenny Bilfield. Her mind-blowing expertise in arts management, curated concerts, and the non-profit world were unbelievably helpful, informative, and inspiring. Speaking with her in earnest was an unforgettable experience, gaining her personal and specific insight to some very important next steps for b&h. As first violinist of the St. Lawrence String Quartet based in San Francisco, Geoff Nuttall’s energy is electrifying. As you can imagine with electrifying energy, he was tireless in his offerings as a performer, coach, and mentor. Being privy to Pedja’s personal networks adds such depth and humanization to the concept of a “Concert in the 21st Century”, as Geoff spoke with such transparency about his career as a chamber musician. Every day we are so encouraged to connect with artists as part of this thriving (not dying) culture. Location: The breathtaking Three Ravens Restaurant. Unobstructed views of Canadian Rocky Mountain range. Tech setup: 5’10” C6 Yamaha brought to the space and placed perfectly to highlight the natural mountainous backdrop. Subtle but exciting light design and spotlights (shout outs and thanks to our production manager, Stuart Bremner!). Guest setup: two long tables of twelve guests (even the President and VP Arts and Leadership of Banff joined us for the evening!). Full place settings with individual menu cards. Five courses. Each had a musical component and a culinary component which were paired together, getting to weave together the sense sight and hearing with taste, touch, and smell. We prefaced each piece verbally, and Chef Sébastien presented his inspiration from our music, connecting to his courses. Inspired by the diversity of a fully coursed meal, we used the bombastic and introspective Sonata for Violin and Piano by Francis Poulenc (inspired by Federico García Lorca’s poem “The Six Strings”), peppered with selections from Manuel DeFalla’s Suite Populaire Espagnole. Using the connecting thread of nationalism and Spanish folklore, the two pieces created a witty arc full of levity, color, idealism, and complexity. Interpreting our program in such a refreshing way, Chef Sébastien used the musical textures and moods to craft a beautifully artistic menu, which parallel to our musical program was full of wit, levity, color, and complexity. Taking pride in the local and seasonal ingredients, he led us on a culinary journey through Alberta, from quail and pickled root vegetables to prawns and smoked sablefish, elk and bone marrow to japonaise cake with lavender meringue. Drooling yet? Take a look at the menu card to see the full descriptions, and you’ll be in a puddle. Tasting an earnest and refined musical impression is an incredibly unique experience we’d highly recommend. As we start week 3, we are so eager to work with new guest faculty, see the projects of our colleagues formalize, plan future collaborations and continue developing this dream-like business we have in b&h. Greetings from beautiful Banff, Canada! "Concert in the 21st Century" at the breathtaking Banff Centre for Arts and Creativity is off to an amazing start! We feel pretty pampered living in luxury at the Banff Centre (we don't even need to make our beds! ), and sharing this residency with 17 other artists from around the world is giving us lots of future travel ideas! Their stories and projects are astoundingly (though not unexpectedly) diverse, and with the help of the unstoppable production team, we're getting to see all these ideas come alive. A true display of community building and networking, Pedja has invited colleagues for a week at a time to share their quirks and anecdotes with us, and boy are there lots of them (colleagues, quirks, and anecdotes)! Last week we were joined by actor/director Daniel Pettrow and lighting designer Chris DePape. Daniel Pettrow is an actor, director, and visual artist hailing from the Wooster Group (New York City), the Centres Dramatiques Nationaux (Paris), Bluemouth Inc (Toronto), and the Heifetz Institute (Virginia), just to name a few. Leading each planned workshop activity with "I have no idea what is going to happen", he heightened our awareness through physicality, spontaneity, and laughter (so much laughter), challenging our perspectives of performance limitations and interpersonal connection. We fully intend on maintaining this new depth (especially the laughter) in our rehearsal process and performance. Chris DePape comes from Calgary, Canada. A true master of lumens, Chris gave us an awesome glance into the world and language of lighting design. We were able to ask a ton of questions, even get DIY advice (tin foil triumphs again! ), and see his artistry live at Pedja's recital. We are really looking forward working with him next week in prep for our concert! Though that all sounds horribly boring, don't worry, we've had a little bit of fun while we're up here as well! As though there isn't enough beauty at the Banff Centre itself, we took a trip to the Fairmont resort at Lake Louise to spend the day. Cross country skiing, ice skating, snowball fights, and ice castles may have all been part of the day. Stay tuned for Week 2, where you'll meet Chef Tessier from the Three Ravens Restaurant where we will be presenting our project performance for this residency! For more pics, check out our instagram @bowandhammer. hey folks. since we've changed the website (yay, squarespace! ), we've also released some of the old formats we've been using for pdfs, blogs, etc. But just incase you are new to Bow & Hammer, here are some links to access our archives, so you can get a sense of what we've been up to the past few years. Bow & Hammer was voted best classical group in Chicago by the Chicago Reader! Support Bow & Hammer and the work we do. Make a contribution today!